Businesses today demand high-speed storage partnered with manageable, reliable security. Designed for business platforms, the Intel® Solid State Drive (Intel® SSD) Pro 5450s Series delivers power-efficient performance with enterprise-ready security and remote manageability. Companies can upgrade client systems from hard disk drives to SSDs to get quicker boot and application load times, helping to... facilitate better productivity. The Intel® SSD Pro 5450s Series is available in capacities ranging from 256GB to 1TB, and in thin 2.5-inch and sleek M.2 form factors, to support all business client needs. 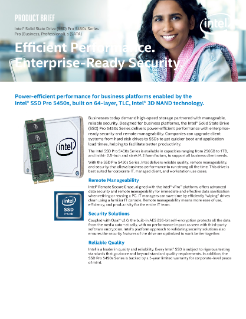 With the SSD Pro 5450s Series, Intel delivers reliable quality, remote manageability, and security that allows business performance to run strong all the time. This drive is best suited for corporate IT, managed client, and workstation use cases. ¿Por qué pasar de un disco duro (HDD) a un Intel® SSD para centros de datos basado en SATA?